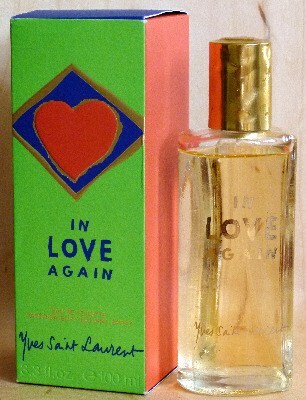 YSL brought back In Love Again as a special edition classic but now even that is hard to find. Cream lid, square bottle, cream box, nowhere near as bonkers as the original harlequin design with it's heart shaped bottle and wild colours. When I first smelled this in the 90s, I almost died of excitement. It was the fruitiest scent I'd ever sniffed, and it smelled of Ribena! These days, the word is full of fruity florals that smell disappointingly similar to each other, but none has the courage of In Love Again, declaring its intentions and demanding that you take notice. So, the new version compared with the old version. Just like Diorella, another of my favourites, it smells almost the same but it doesn't feel the same. New In Love Again lacks the punch and power of the original. That's why I'm sharing my second bottle - one I bought unopened and broke into in the company of the lovely Odette Toilette - so you can experience the original if you like.